Rachel Gay defends a Dayton Christian player Dec. 6. Legacy forced 20 turnovers in a big win. 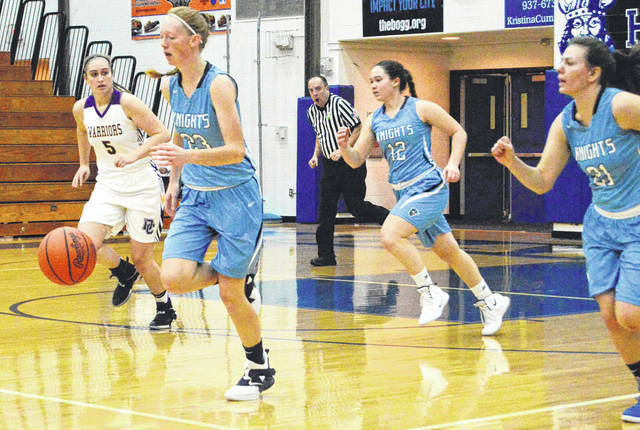 Scott Halasz | Greene County News Emma Hess leads the Legacy Christian fast break up the court at Miamisburg High School. Hess scored 23 points, matching her jersey number. Emma Hess lets a 3-point shot fly against Dayton Christian. Emily Riddle (10) and Emma Hess (partially hidden) trap Dayton Christian’s Camryn Collinsworth. Legacy’s Katie Leach guards a DC player. MIAMISBURG — It took Legacy Christian Academy nearly two minutes to score Thursday against Dayton Christian. But once the Knights’ first bucket went in, they seemingly kept coming all night as LCA rolled to a 65-23 win at Miamisburg High School. 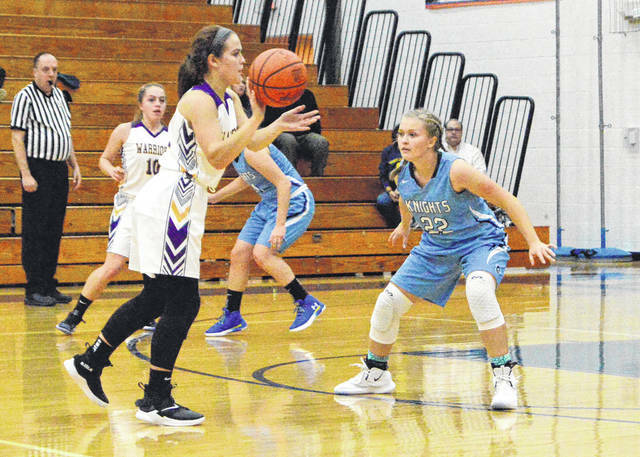 Emma Hess scored 23 points and Emily Riddle added 16 for Legacy, which never trailed and was never threatened in improving to 5-1 overall and 2-1 in the Metro Buckeye Conference. The Knights ran the fast break to near-perfection and were also solid in the half-court offense after some early sloppy play. Combs said his team generates good shot opportunities, but stresses that an extra pass creates a great shot. “I thought they did that as it went on,” Combs said. Hess and Riddle were the beneficiaries of the extra pass early as they drained several open shots in helping the Knights jump out to a 17-2 lead after the first quarter. Margaret Kensinger and Danielle Matthews also scored during the decisive first quarter. Riddle and Kathleen Ahner hit back-to-back 3-pointers to start the second and after DC’s Kiara Sanders hit a 3-pointer of her own with 5:38 left, Hess and Riddle took over. They each scored seven points as Legacy led 40-10 at halftime. The lead reached 58-10 after three as Legacy stingy defense — especially inside the paint — held Dayton Christian scoreless in the third. Overall, the Knights forced 20 turnovers and allowed very few open shots. Legacy is allowing just 37 points per game this season, and if not for a 62 point outburst by Waynesville, the Knights would be allowing just 32 per game. Combs was able to sub freely throughout most of the second half and the Knights’ second unit matched the starters in intensity and effort. In all, nine players scored for Legacy. Ahner, Allyssa Free, and Maddy Combs each had six points, while Kensinger, Matthews, Katie Leach, and Maria Usynski each had two. 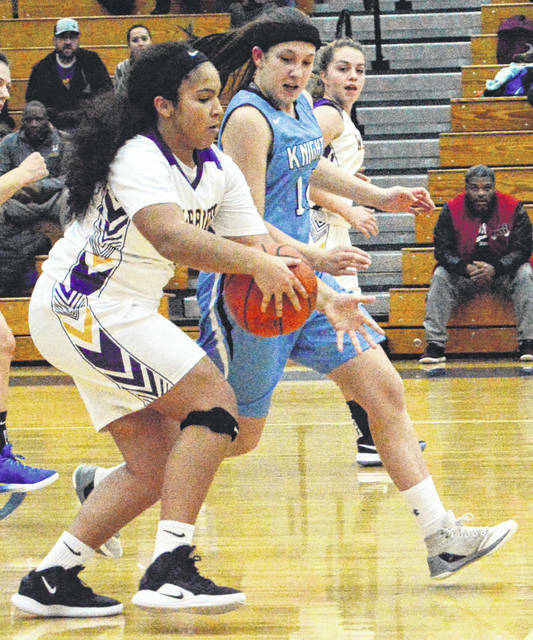 Kiara Sanders led DC with nine points, while Kayla Ogburn added six. The Knights are at Yellow Springs 6:45 p.m. Monday, Dec. 10, while Dayton Christian (2-2) visits Miami Valley 7 p.m. the same day. https://www.xeniagazette.com/wp-content/uploads/sites/32/2018/12/web1_DSC_0013_ne2018126205447652-1.jpgRachel Gay defends a Dayton Christian player Dec. 6. Legacy forced 20 turnovers in a big win. https://www.xeniagazette.com/wp-content/uploads/sites/32/2018/12/web1_DSC_0004_ne2018126205451880-1.jpgScott Halasz | Greene County News Emma Hess leads the Legacy Christian fast break up the court at Miamisburg High School. Hess scored 23 points, matching her jersey number. 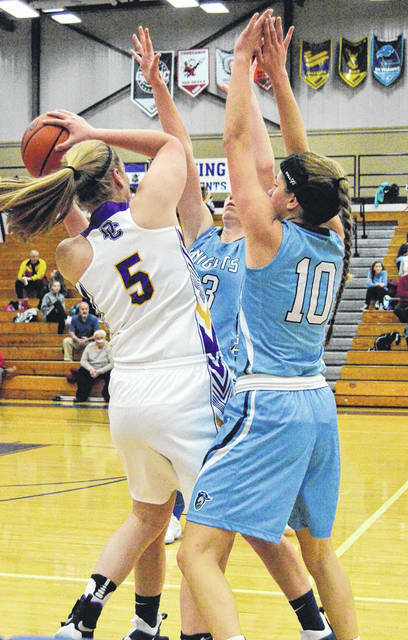 https://www.xeniagazette.com/wp-content/uploads/sites/32/2018/12/web1_DSC_0006_ne201812620550111-1.jpgEmma Hess lets a 3-point shot fly against Dayton Christian. https://www.xeniagazette.com/wp-content/uploads/sites/32/2018/12/web1_DSC_0010_ne2018126205538-1.jpgEmily Riddle (10) and Emma Hess (partially hidden) trap Dayton Christian’s Camryn Collinsworth. https://www.xeniagazette.com/wp-content/uploads/sites/32/2018/12/web1_DSC_0011_ne201812620557841-1.jpgLegacy’s Katie Leach guards a DC player.